Earlier this year we were thrilled to hear that one of our donor sign ups in 2017, Stuart Freeman, had been matched with a patient in need. 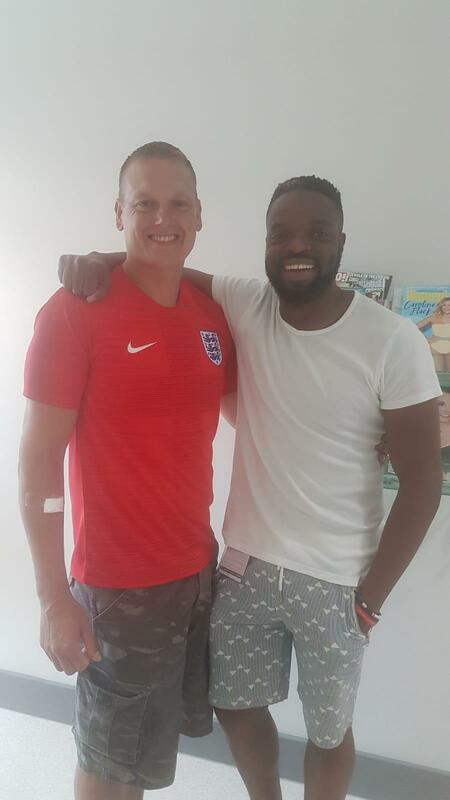 In July this year we were pleased to accompany Stuart on his visit to the London Clinic where he harvested his stem cells for the first time and was able to donate these cells to give his recipient a second chance at life. 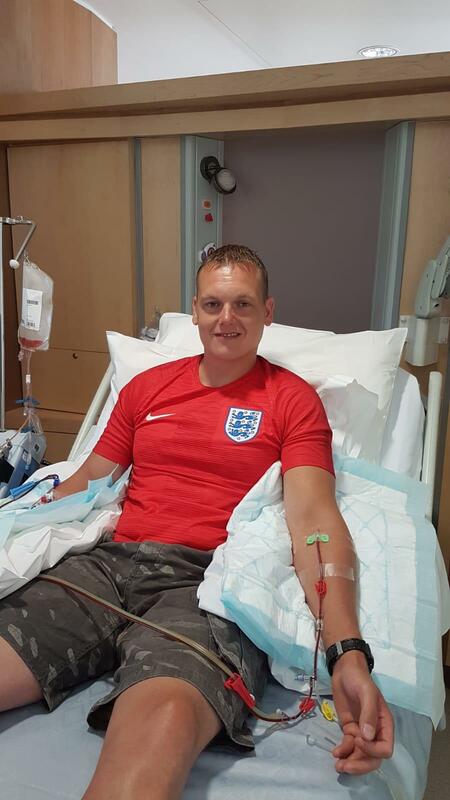 We interviewed Stuart after his donation to give us some insight into his experience of being a stem cell donor and potential life saver. 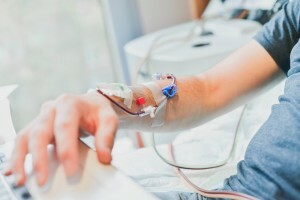 How and why did you originally register as a potential blood stem cell/bone marrow donor? 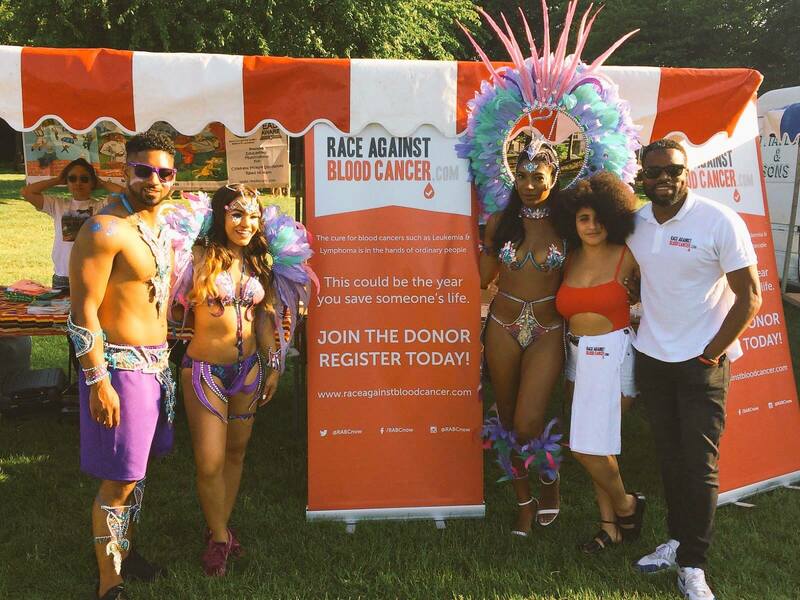 I was with my brother at the Lilleshall 10k running event last year where Race Against Blood Cancer were holding a donor drive. 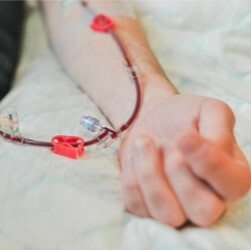 I knew of someone who had blood cancer but I knew nothing about the stem cell or bone marrow donors or how they are used to help blood cancer patients. However, when I was shown how easy the sign up process was I went ahead and registered. How did you find out you were a match for someone and how did you feel? DKMS called to tell me I was a match for a patient in need – I obviously wanted to do it but like most people I did feel a little nervous as I hadn’t really researched the actual donation process beforehand, and didn’t know if there may be any long term side effects. Once I spent a bit of time researching the process I felt more at ease. Knowing that I may have a few short term side effects didn’t bother me as I knew I could be saving a life. Did you get to choose the method of donation? 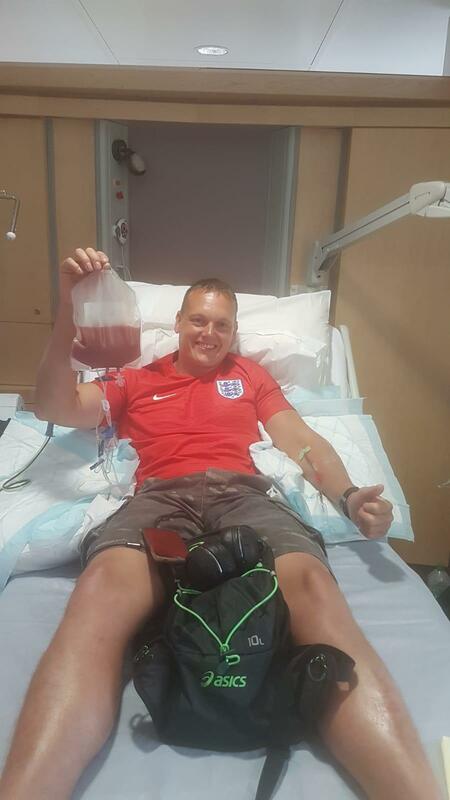 Yes I did – Initially they asked for bone marrow, which I was happy to donate but after reviewing the recipient’s needs the patient team were more than happy to take my stem cells instead. I had a medical a few weeks before which I attended at the London Clinic and then 4 lots of 4 injections, four days before the actual donation. 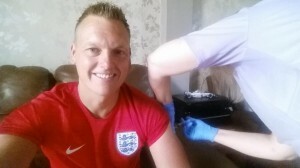 The medical team also came out to me to do the injections – I was originally meant to be paintballing and so they were even prepared to come out to the venue, but it got cancelled so they came to me at home whilst I was watching the England World Cup game instead! Where did you go to harvest your cells and how long did the process take? 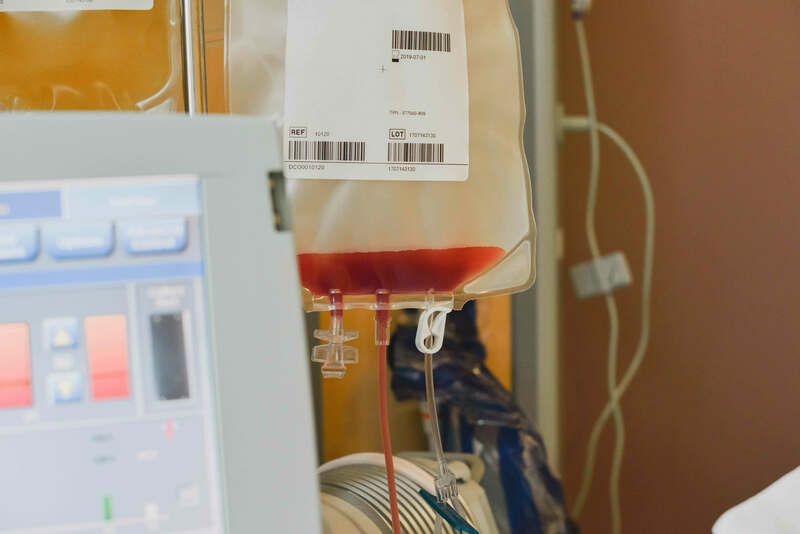 I went to the London Clinic for my procedure – it took around 3hrs 50 minutes to collect the stem cells and I had to wait for around 30 minutes afterwards for them to check I had donated enough cells. They needed 5 million but managed to collect 23 million in that short time. I was told they would use what they needed and freeze the rest for anyone else who may need them. Is it painful and did you experience any side effects? I didn’t experience any pain as such; I just had the usual side effects that I’d prepared myself for, so I was slightly achy in the lower back and feeling a little groggy after the injections. The medical team told me I would feel better after the stem cell collection and they were right. The following day I was feeling 100% again! Did you incur any costs? DKMS covered my travel and hotel stay as I lived quite far from the clinic. I was also given the opportunity to use an optional food and drink voucher but I used my own money. How did you feel mentally and physically after the donation procedure was over? I actually felt really good physically almost straight away; any side effects you have are not serious and are only short term. 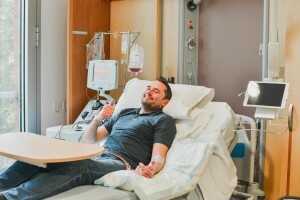 I felt so positive that I had the opportunity to save a life and be able to raise awareness of being a donor and what the process involves – the worst part was being on camera! How do you think we can encourage other people like you to register? It’s really important to me to get across how easy it is to register and to donate. Just a few hours of my time could have potentially saved a life and that makes me feel great. For me it’s all about the awareness, if I can help inform people that life saving like this exists and show how simple the process is, then I know people would register in a heartbeat! We would like to say a massive thank you to Stuart – the impact that he is going to have on his recipient life can’t be put into words. We would also like to thank you to DKMS, the medical team and the amazing staff on the day at The London Clinic. Over the weekend Insteps Dance Academy and Fullout Dance Academy, based in Ludlow and Leominster, hosted their annual dance show. 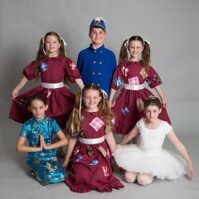 They performed 4 shows over 2 days to over 600 people. Once again, this year they chose Race Against Blood Cancer as their charitable partner and held a raffle to raise much needed funds. Not only was the weekend a great success for the academies but they also managed to raise £354 for our charity. We would like to say a huge thank you to all those involved – these funds will help us to continue to raise awareness and register more potential lifesaving blood stem cell donors! 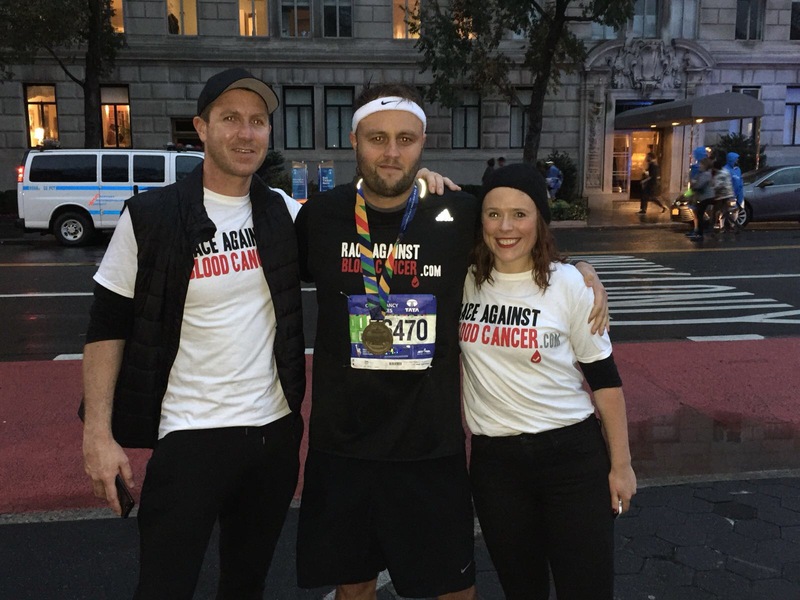 Race Against Blood Cancer finds another donor match!!! 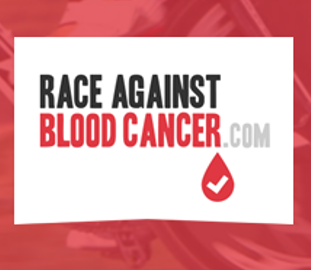 After all of the excitement over the England World Cup match yesterday, the team at Race Against Blood Cancer is even more excited to share our match news with you. One of our donor sign ups has been called to donate to a patient in need of a lifesaving transplant! 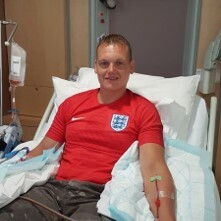 Stuarts procedure will take place this Monday 9th July – watch out for live updates across our Facebook and Twitter channels to hear from the team and Stuart about his donation journey. We wish Stuart the best of luck tomorrow and hope the process runs smoothly for him. 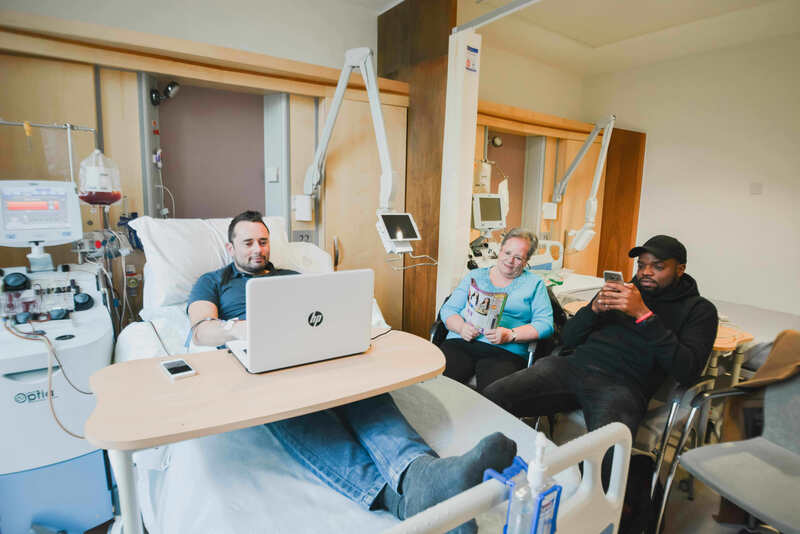 We are also thinking about that special person who is about to receive this priceless gift – the impact Stuart will be having on this patients’ life is impossible to put into words! THANK YOU! 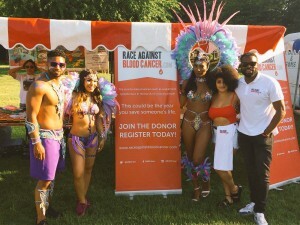 Last Sunday Race Against Blood Cancer held a donor drive supporting Flagz Mas Band at Wandsworth Arts Fringe in London, where the team worked hard to sign up more potential lifesaving donors to the blood stem cell register. We would like to thank all those that showed up to register and to the organisers for allowing us to pitch up and engage with the community. We would also like to give a special thanks to the work of our team members Alex Morrison and Lenah Lang who continue to help those people needing lifesaving transplants. 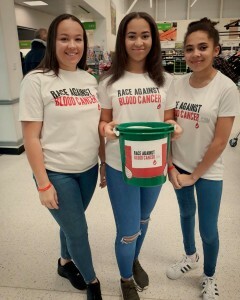 Last Saturday we held a community fundraiser at Asda in Donnington, Telford, to raise money for the charity. 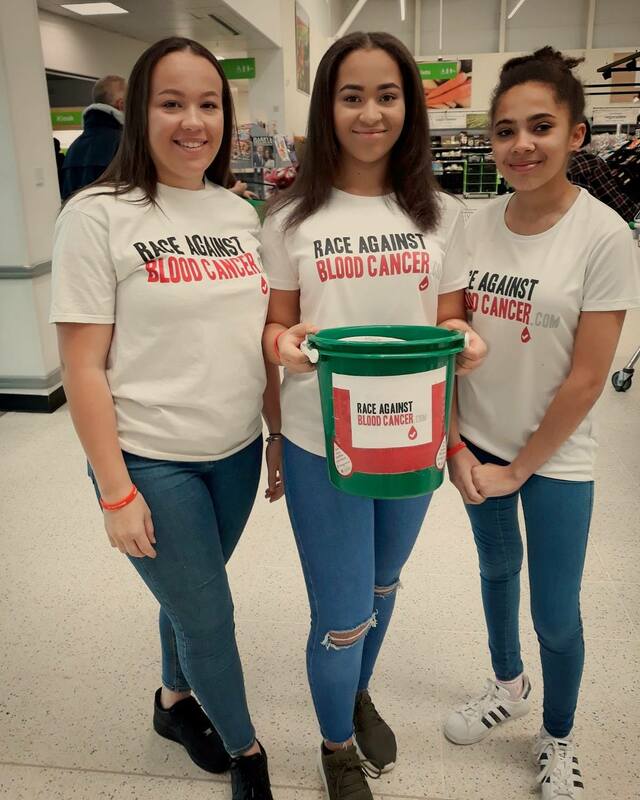 Race Against Blood Cancer volunteers and a group of fantastic local young people aged between 6 and 16 gave up their sunny Saturday to help pack shoppers bags and raised over £390 for the charity. Funds raised will help us work to find more lifesaving donors for people needing stem cell transplants. We would like to say a massive thank you to Asda Donnington – particularly June Walker who helped us organise the bag pack and to the Telford community for their generosity. We would also like to show our appreciation to those who worked hard on the day – Gemma Elsmore, Sarah Elsmore, Gail Fisk, Ayiana Francis, Tia Drummond, Rae Drummond, Marcus Hodson, Aaliyah Khan, Simra Khan, Khakis Khan, Pheobe Morgan-Steele and Austin Round. 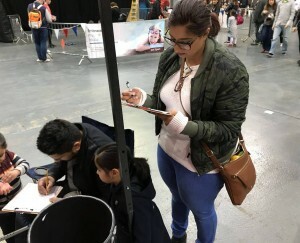 Last Saturday the Race Against Blood Cancer team hosted another donor drive at the popular event Shropshire Kids Festival 2018 at the Telford International Centre. The event was full of busy families getting involved in all of the activities on offer, and the team still managed to sign up an impressive 57 blood stem cell donors amongst the madness! We’d like to say a massive thank you to everyone who visited the stand and took an interest in the charity, and a special thanks to those who registered! 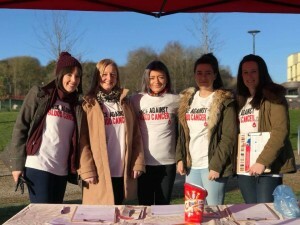 We’d also like to show our appreciation to the organisers Shropshire Festivals and our amazing team Gemma Elsmore, Sarah Elsmore, Beth Elsmore and Jodie Thompson for spending all day on their feet, encouraging the crowd and signing up new potential donors who could help save the life of someone with blood cancer! 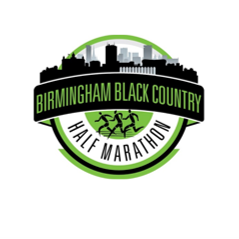 On Saturday 7th July 2018 a number of friends of Race Against Blood Cancer will compete in the Black Country Half Marathon to raise much needed funds for the charity. 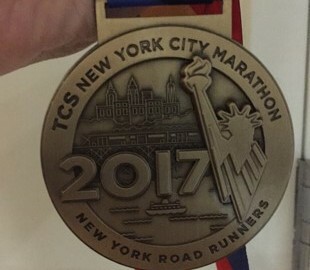 Alex Morrison, Jonathan Dawes, Richard Dawes, Tom Sheppard, Nick Wilson, Jayme Duncan-Emery, David Bradshaw will all be running in their first half marathon so your support will be much appreciated. Good luck guys and many thanks in advance for all your efforts! Yesterday, on a cold January morning the Race Against Blood Cancer team held their first donor drive of 2018 at the Telford 10K in Telford Town Park, signing up 34 potential life-saving donors. The team would like to show their appreciation to Telford Athletic Club for allowing us to host a donor drive at the event. 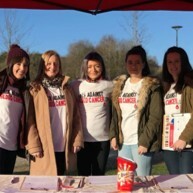 We’d also like to say a massive thank you to our community engagement officer Gemma Elsmore and her fab team of volunteers Natalie White, Rebecca Richards, Kayleigh-Jamie Millis, Sarah Elsmore and Danielle Hoyle. 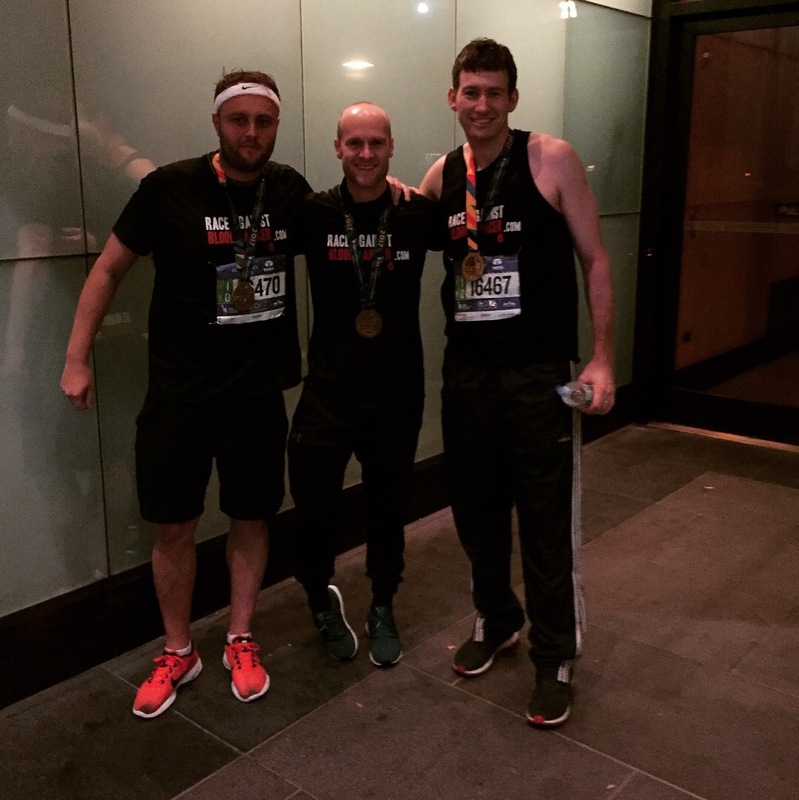 And finally, a big thumbs up to Joe Bates, Tom Sheppard and Andrew Pugh for running and representing the charity! Remember if you’re organising an event this year and would like us to be involved by hosting a donor drive then please get in touch! Wednesday 15th November 2017 will go down in Race Against Blood Cancer history as the day that one of the donors that the team registered went on to successfully donate their stem cells in hope of saving the life of a patient in need. After coming close on no less than 10 other occasions, the team were overjoyed to learn that James Burton had been invited to Harley Street, London, to carry out the important yet simple procedure. What made the news even more special was that James registered at the launch event for the charity in the summer of 2015, where the team held a dinner, dance and golf tournament to announce their arrival as a burgeoning charity with big ambitions. James had originally been contacted to be a match last year but at the last minute, to his disappointment he was informed that he wasn’t required. This time around everything was smooth sailing. James had a nurse visit him 4 days prior to heading to the clinic, to give him an injection to stimulate the growth of his white cells and travelled to London the day before the procedure. In the end James harvested his stem cells over the course of two days with the procedure itself painless as expected. For those of you following the live video footage via Facebook, you’ll have seen a very relaxed James occupying himself by playing Football Manager throughout, while being amused by Alex Morrison, our Community Engagement lead. We would like to say a massive thank you to James – words cannot express how grateful we are to him. We would also like to thank all of those who have donated and continue to support Race Against Blood Cancer, DKMS and the incredible staff on the day at The London Clinic. Witnessing the life changing impact their efforts have had for a blood cancer patient in need, the team is as motivated as ever to find the next James Burton and have some great plans in place to continue raising awareness of the lack of diversity of those signed up to the donor register and running many more donor drives to find many more matches. 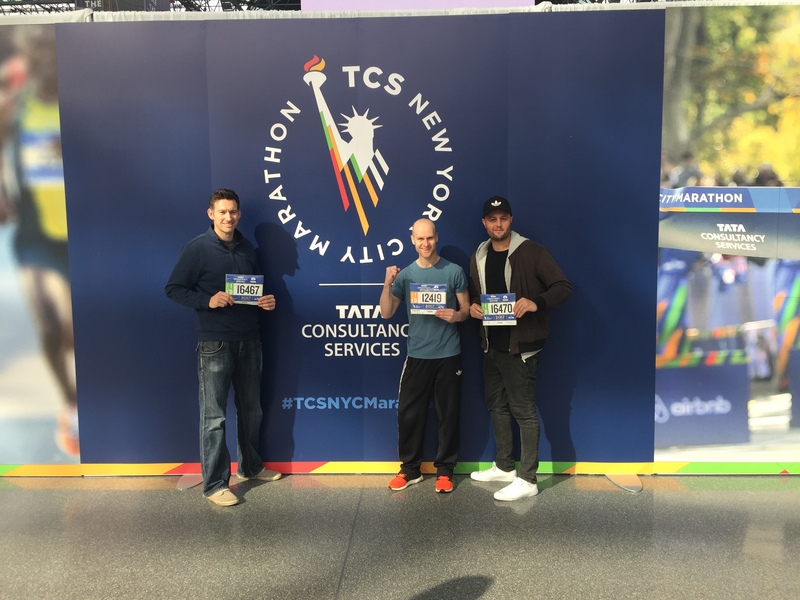 On Sunday 5th November, Joe Bates, Andrew Pugh and John Fawcett took on the most famous marathon in the world – the New York Marathon. 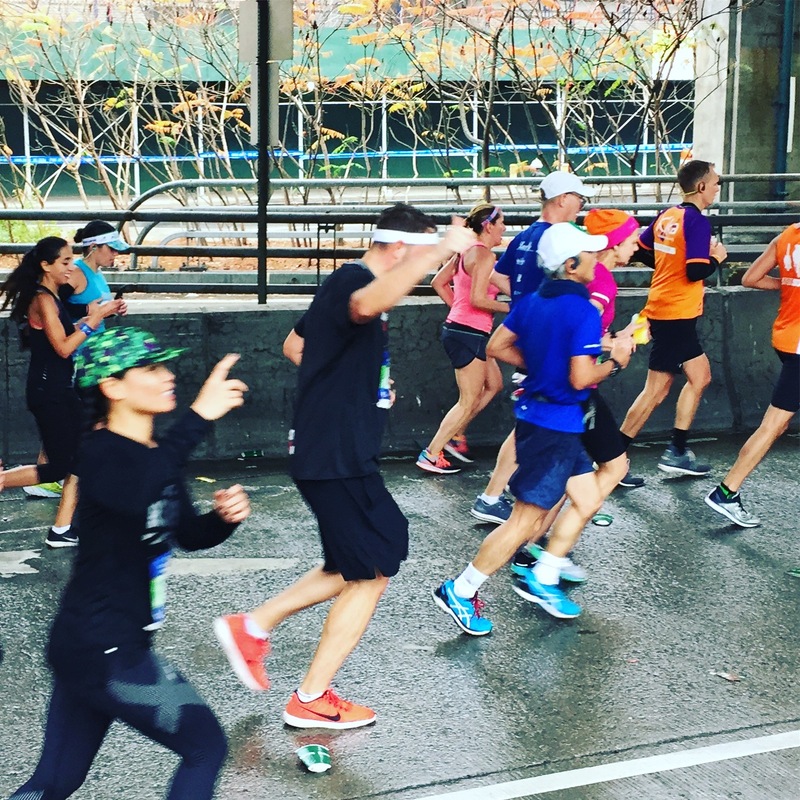 For Andrew and John, the prospect of navigating the 26.2 mile course was a little less daunting as two marathon veterans. 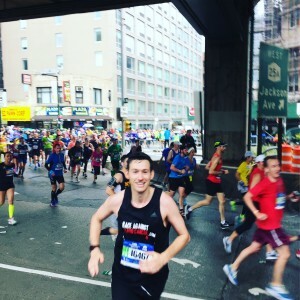 For Joe, who has been an integral member of the charity since its inception in 2015, he was attempting to complete the feat for the first time. 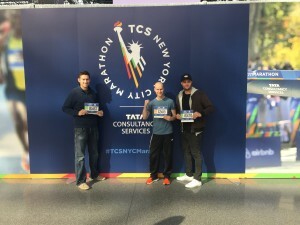 The trio got off to an early start, meeting at the New York Public Library at 5.45am to embark on an unusually long 3 hour coach journey to the start line in Staten Island. After a rousing rendition of Star Spangled Banner they were off. The weather on the day was forgettable, although the cloudy skies and intermittent rain wasn’t enough to deter the 52,000 runners and over 1 million spectators lining the streets, along with live bands and DJ’s adding to an incredible carnival like atmosphere. A huge thanks to the support team who cheered the guys along with notably mentions to Tom Sheppard who travelled over from England and Lucy Baumgartner who provided support both on the day and throughout. All three runners performed admirably on the day, with a special call out to Andrew Pugh who broke his personal best time on a notoriously hilly course by crossing the finishing line at 3 hours and 29 minutes. Great job Andrew! 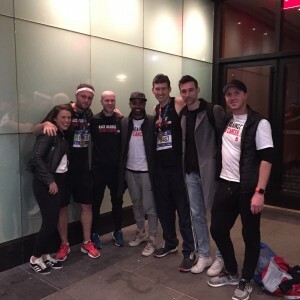 Most importantly the team raised over £6,000 which will prove to be invaluable in helping us to continue to raise awareness of the lack of diversity of those signed up to stem cell donor register and carry out donor drives in both the UK and US. Over 90% of people donate stem cells NOT bone marrow - this is a similar process to giving blood! Made with love for the nicest guy in the world. A selfless & caring man who is there for everyone when needed. Now we are there for you.